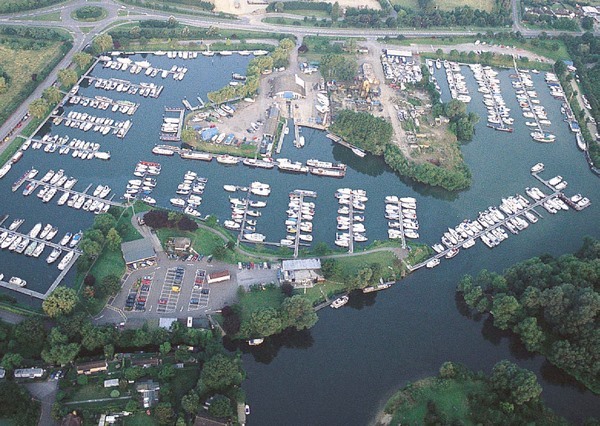 Set in 80 acres and with 575 berths, Penton Hook is Britain’s largest inland marina. It is situated on one of the loveliest reaches of the River Thames, close to the Chertsey and about a mile downstream from Runnymede where King John signed the Magna Carta. There are numerous other places to visit on the Thames – cruise upstream to Windsor and the charming village of Datchet and follow the river as far as Oxford, taking in the many waterside restaurants on the way. Thorpe Park is also within walking distance, offering hours of fun and amusement for the whole family. Our Bray and Windsor marinas are within a few hours cruising; and offer reciprocal berthing facilities for Club Outlook members. Or, in around six hours, you can cruise into the tidal Thames, right into Central London. The site provides first-class amenities in sheltered waters and boasts four facility buildings, which include showers, toilets and full disabled facilities. Penton Hook Marina also offers purpose-built pontoons for narrowboats and Dutch barges, including a number of moorings for vessels up to 30 metres. There is also a private yacht club which organises a full programme of activities.